Are the people of Myanmar able to distinguish between Norway’s role in promoting peace and the commercial interests of Norwegian businesses? Now that several state-owned Norwegian companies have entered into large and risky ventures in Myanmar, Norway is walking a tightrope between peace and commerce. The maintenance of support for the peace process is critical. Norway has gained an international reputation as a peace builder, a role enabled by, among other factors, the Nobel Peace Prize and Norway’s status as a small country on the edge of Europe, without superpower pretensions. Norway’s oil wealth has made it possible for the country to play a more active role internationally, but our wealth may threaten our international reputation if others begin to suspect that we are mixing our peacebuilding and commercial roles. There is a long way to fall. Myanmar (Burma) is a country where Norway must proceed with caution in order to balance our commercial interests against our role in efforts to promote peace. The distinction between these two roles must be apparent to others. In 2012, President U Thein Sein asked Norway to become involved in the peace process in Myanmar. This led to the founding of the Myanmar Peace Support Initiative (MPSI). This initiative had two goals: first, to support the ceasefire agreements that the central government and army had signed with various groups of ethnic guerrillas; and second, to help ensure that the sorely tested populations of areas affected by ethnic conflicts could experience actual benefits from the agreements. The MPSI has been particularly important in improving the living conditions of internally displaced people. Many of these people have never experienced peace, as parts of Myanmar have been embroiled in civil war ever since 1947. Norwegian People’s Aid is involved in several of the MPSI projects and PRIO is following the peace process by conducting a number of research projects. An independent assessment of the MPSI conducted earlier this year concluded that the ceasefire agreements have given people in the conflict areas an increased feeling of security. At last they can travel without hindrances. Harvests have increased, living standards have improved, and there is better access to health services. In encounters with internally displaced people, we have seen an increased belief in the peace process in areas with ceasefire. But there are still no effective ceasefire agreements in several of the states within Myanmar. Myanmar can look back at 50 years of military dictatorship and currently finds itself in the early stages of transition from dictatorship to democracy. When the country opened up to the rest of the world in 2012, thousands of political prisoners were freed and President U Thein Sein promised reforms, peace and development. Not only was Myanmar to become a constitutional democracy, but there would also be an end to warfare between the army and 17 armed guerrilla groups. The central government, the army, ethnic guerrilla groups, political parties and civil society representatives are now working intensively to put in place a unified, nationwide ceasefire agreement and to engage in a political dialogue concerning the country’s future. The situation is extremely complex, and it is clear that the peace process in Myanmar will take many years. We must also anticipate that there may be setbacks. Myanmar is considered one of the world’s most corrupt countries. The army is not under civilian control. Currently it has the power to appoint a quarter of the representatives in assemblies to which all other members are directly elected, and has the ability to reclaim power. 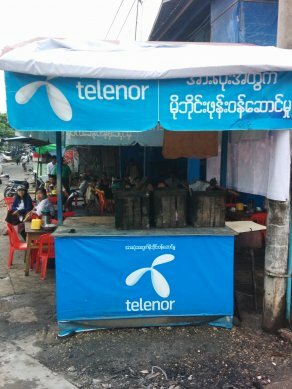 In 2013, Telenor was awarded a licence as a mobile network operator in Myanmar, and earlier this year Statoil was granted a licence to extract oil in the Andaman Sea. Statkraft is in talks with the Myanmar government about investments in the hydropower sector. Other Norwegian companies are also looking into opportunities in the country. Myanmar needs investments, particularly from companies who operate a policy of zero-tolerance for corruption. But can we take it for granted that the people of Myanmar and international actors see a distinction between Norway’s role in promoting peace and the commercial interests of Norwegian businesses? Issues that we may consider unproblematic in Norway may quickly become a stumbling block locally, where the peace process requires a high degree of trust. We have had to reassure our local contacts that Norway’s support for the peace process was not motivated by a desire for lucrative investment opportunities. Will Norway be able to strike a balance between its peacebuilding efforts and its commercial interests? This is an issue that the political leadership at Norway’s Ministry of Foreign Affairs should be concerned about. The MPSI is scheduled to be phased out by the end of 2014, in accordance with the plan that it should be a short-term initiative. There is, however, a danger now that this phase-out will fuel suspicions that Norway’s involvement in the peace process was a means of gaining access to commercial opportunities. An historic national ceasefire will hopefully be implemented during the remainder of 2014. This may well be fragile, not least in Kachin State, which is still ravaged by civil war. Here there will be a need for the same type of support that Norway has provided in other conflict zones. We recommend that the phasing out of the MPSI is followed up with increased support to areas where the need is greatest, preferably through a new initiative. In addition, support for internally displaced people in areas that have been receiving support since 2012 must not be phased out too soon. Morten Høglund, state secretary at the Ministry of Foreign Affairs, visited Myanmar recently. The Norwegian parliament’s Foreign Affairs Committee has also been there. These are positive developments and bear witness to a continued focus on Myanmar. Let us hope that there will be increased understanding of the fragility of peace in Myanmar, where the run-up to the general elections scheduled to take place next year could easily lead to further ethnic and religious violence. Norway’s two roles as a supporter of the peacebuilding process and as a commercial investor must be combined with a clear and transparent division of responsibilities. At the same time, it is clear that investors and peacebuilders have much to learn from each other. Knowledge about conflict management in the country is essential if investments are to be conflict-sensitive and assist in sustainable development. The Norwegian Ministry of Foreign Affairs has put forth the view that commercial interests should have greater priority in Norwegian foreign policy. This is good, but it must not come at the expense of Norway’s efforts to promote peace. This text was published in Norwegian 16 October 2014 at NRK Ytring: Norges balansekunst i Myanmar.